What no meat? What you mean You no eat meat? It's ok I'll make a lamb! If you've seen the movie My Big Fat Greek Wedding, you remember those lines. I always crack up when someone says "I don't eat meat" because those words pop in my head. Well, right now, they come up a lot. My best friend whom I consider my "Sissy" and her 'man' are staying with us. They are vegan. She is mostly raw. This can be challenging when fixing meals. Once upon a time I was as well, however, from my site you know I no longer am. So, the past few days I have been on the hunt for filling, nutritious, delicious vegan recipes. I have some from the past but am really looking to be adventuresome. Today I have made another bowl of the Mediterranean Salad , faux meat mix/veggie burger mix and a healthy raw protein smoothie/shake. On top of having a whole chicken roasting in the crock pot for my husband and sons. 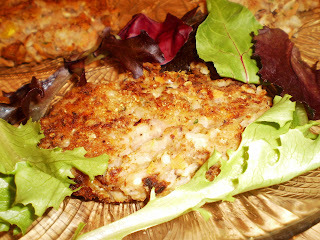 For the veggie burgers I got my inspiration from Angela over at Oh She Glows, she has some wonderful recipes and her pictures are beautiful. The mix I made is similar but not exact. I'll have a post and pictures up later. I tasted it and it is really good. All these ingredients went into my Vita Mix and off she went. Blitz up and ready to drink...oh yummy and filling as well. Give it a try, you can use a regular blender. The frozen banana keep the drink cold and does not water it down like using ice. Also it adds a thick consistency like a shake would have. I'll be back later with pictures and details of the veggie burgers! Well, the vegan burger tasted good but were ugly! They would not stay together and I wound up baking them in the oven. The few I cooked in grape seed oil tasted the best but they were tasty just ugly. They went beautifully with a bed of organic baby green mix and the Mediterranean salad. Everyone was satisfied as the guys had roasted chicken and the salad. All these items were mixed together, patties formed and sauteed in grape seed oil. I admit, they were tasty but very difficult to cook as the mixture would not stay together. I finished the remaining mix in the oven. Next time I will try chick peas as Angela did in hers. 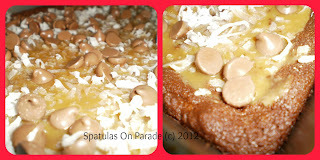 Yesterday started off raining and really put me in the mood to bake, however, there were things to do and places to go. Today started off dreary and little to do, shock I know, so I jumped right at it. Cinnamon roll cake, this is not for the faint of heart, diabetics or dieters. Just a word of warning, this cake would do Paula Deen proud as there are 3, yes 3, sticks of butter in this bad boy. That is why this is the third time in a year that I have made it. It is a treat and I was feeling like I needed one. 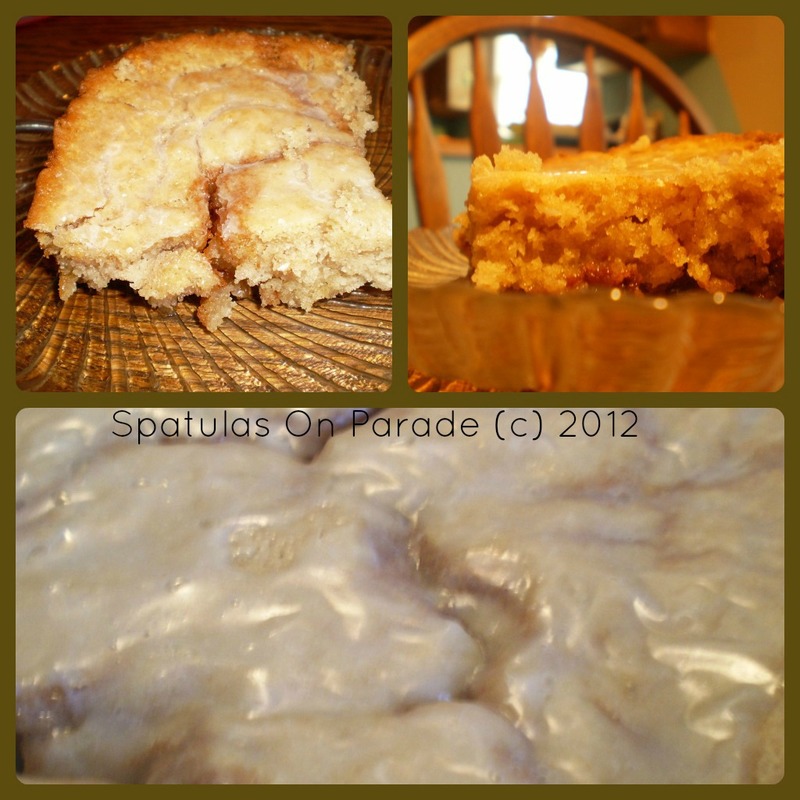 It is moist, sweet but not too sweet, cinnamony and delicious. I do hope you will try it. A friend sent me the recipe sometime last year and she got it off of a site called Cookin' Up North, at least I think that was it. Mix all of these ingredients except for the butter. After they are mixed, pour in the melted butter. Pour this mixture into a 13 x 9 greased baking dish. Blend these ingredients well and place by the spoonful around the top of the cake batter. Swirl with a knife. Mix well and pour over cake after it has cooled slightly, 10 minutes or so. Cut and serve. I don't know about you, but I have seen many different versions of a Mediterranean salad on blogs, in cookbooks and on Pinterest. I even copied one down. However, when I went to make it tonight I decided to change it up and make it my own. Why? Because that's what I do. Oh it was so good, clean and refreshing. I hope you try it as your next side dish. Slice, dice and chop all the ingredients, put them together in a bowl, mix well and chill. Serve as a side dish or a great lunch! This was totally new for me and outside the box. My husband and I watch Rick Bayless' show called "Mexico one plate at a time". He is a chef with two restaurants in the Chicago area. We really enjoy it. He did a shrimp ceviche one day and my husband has talked about it every since. I decided to step out and make my version, mainly because I don't follow instructions well and I did not have everything he used. Wash all ingredients first. In a large bowl, juice the limes, add the cilantro and garlic. Dice all your peppers and onion, add to the bowl. I put my tomatillos and tomatoes in the food processor for a fine chop. Peel the shrimp and add those. Stir all ingredients well, cover and chill for 3 hours. The lime juice will cook the shrimp. My husband enjoyed it. He said "it has a nice flavor pallet" Guess I did a good job. WOW today was a busy busy day. Menu writing, making my shopping list, hitting the stores, putting up all the fabulous food and prepping, cooking and cleaning! The ceviche was for my husband. The Sonoma chicken salad is for our lunches for the next few days and the Mediterranean salad and red pepper beef pasta was supper! OH MAN I am stuffed! Oh plus we had homemade honey wheat bread to go along with it. My husband wanted to know where dessert was. I said, who has room? 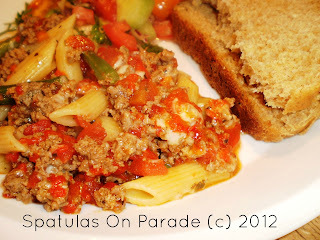 The Red Pepper Beef Pasta I saw on this weeks Foodie Friends Friday link party. It looked so good I had to try it. So glad I did. It was a big hit! So thank you Lady Behind The Curtain for a wonderful recipe! Click the link and it will take you to her recipe! Fabulous. Place peppers in a food processor; cover and process until smooth. 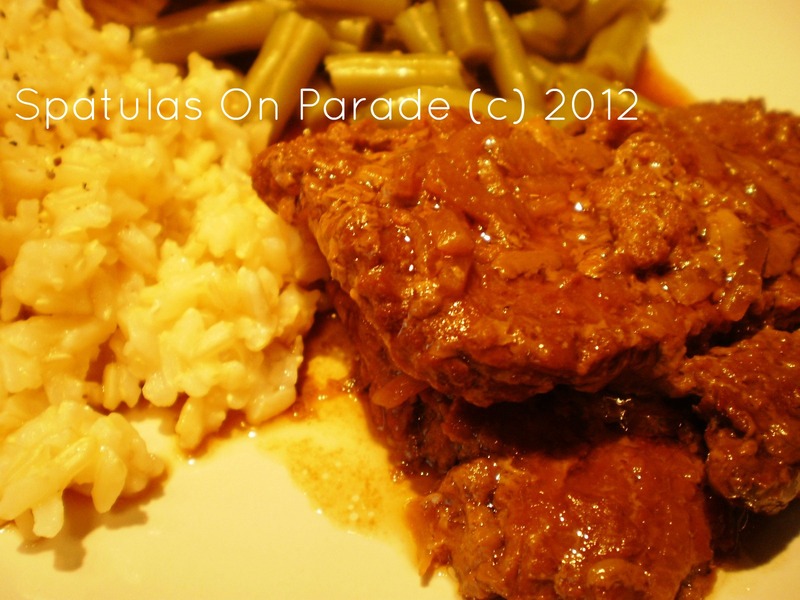 In a large skillet, cook beef and onion until meat is no longer pink; drain. Stir in the pepper puree, tomatoes, garlic, oregano, basil and salt. Bring to a boil. Reduce heat; simmer uncovered, for 15 minutes. Meanwhile, in a Dutch oven, cook pasta according to package directions, adding green beans during the last 5 minutes of cooking. Cook until pasta and green beans are tender; drain. 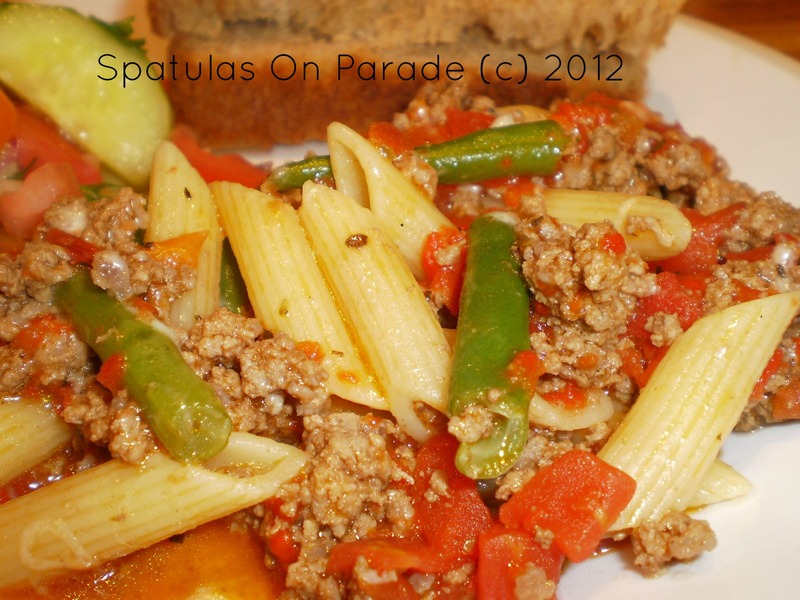 Return to the pan; stir in meat sauce. Sprinkle with cheese; stir until melted. Oh my, it's good to be home! I had a great visit with my mom, loved spending time with my grand-daughter, saw a very precious friend and my dad is doing much better, but there is no place like home. Your own bed, husband, kids, fur babies...and getting back to my blog! I was having withdrawals!! I also want to say THANK YOU to those who have been praying for my dad. He is still in the hospital but doing much better and the surgery was a success. Now on to the recipe. I made this before I left but did not get a chance to write about it. This is a recipe I found over 10 years ago in a Betty Crocker cookbook, I think it was Low Fat Low Cholesterol Cooking. It is really tasty, easy and is wonderful on a hot evening, at a barbecue, potluck, luncheon and everything in between. I hope you'll give it a try and love it as much as I do. I normally double the sauce because after it chills it can be a little dry for me. You can make it as directed and if you want, mix up some more sauce and pour on later. 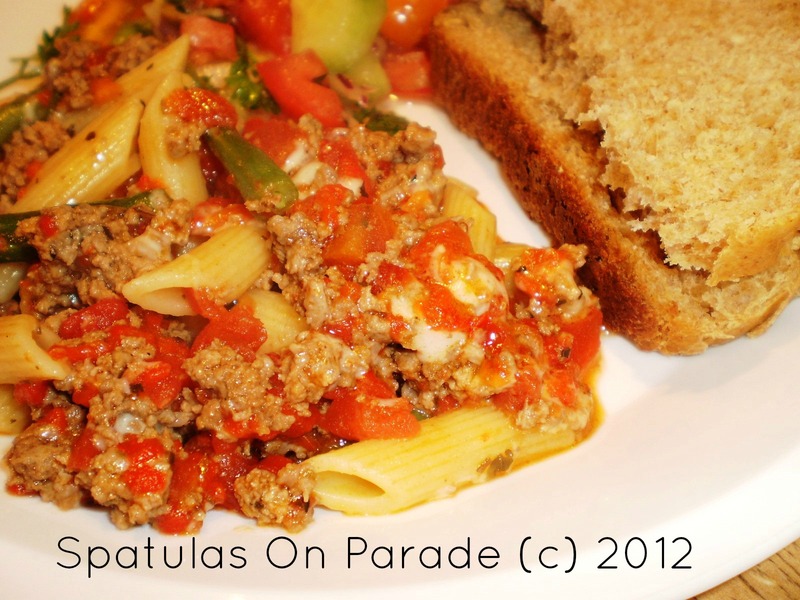 While your pasta is cooking, prepare all the other ingredients. This is a great dish for using leftover chicken but if you don't have any you just cook up a nice size breast or two and dice it up. 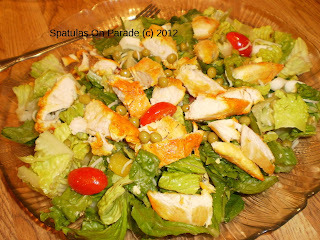 Once the ingredients are ready, toss it all into a large bowl and pour the dressing over it. Mix well and chill for a few hours. This can be served once it is made or chilled. 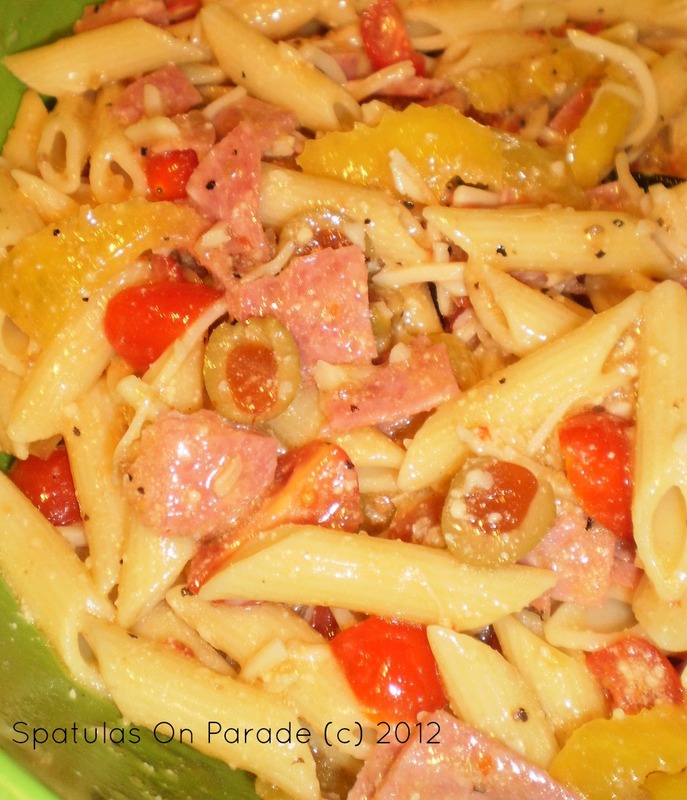 Mix well and pour over the pasta salad. Hi guys, sorry there are no new post but I am out of town due to my dad being in the hospital. I owe you all a big thanks for the emails, Facebook messages and prayers. My dad has surgery tomorrow. As soon as I am able, I'll be a posting fool!! I have several things I need to get to you all that I am sure you will love. 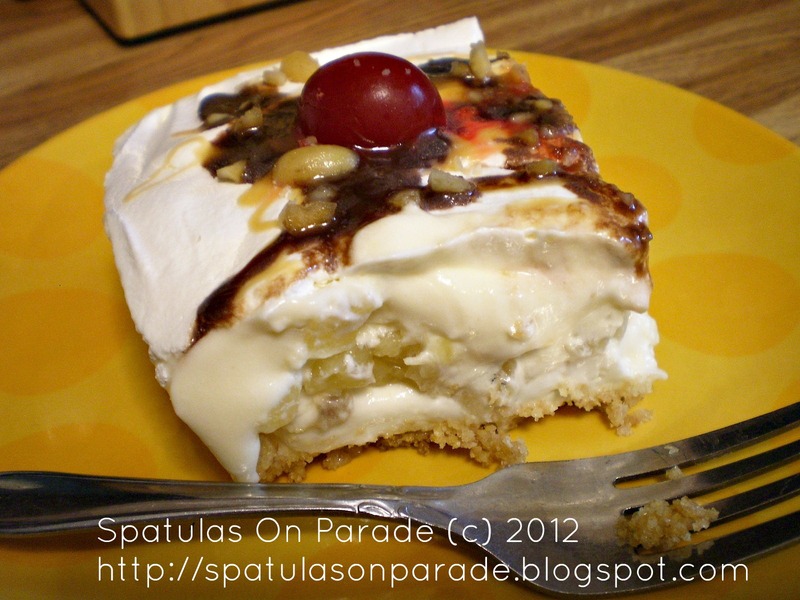 Until then, check out the recipe list tab for all the previous goodies! I saw these a week ago over at myfavoritethings.miranda.blogspot.com and KNEW I had to make them. Of course I did not follow the recipe, I rarely do. You can follow what I did, recipe below, or go to her blog and check it out. I have not tasted them as of yet, but they are made and look/smell fantastic. I'll come back later and tell you how they taste. Slowly add the flour and then cocoa to form a dough. If there is one thing we love around here, beside chocolate, it's pizza. So last week when I was combing through the old dusty memory banks, I vaguely remembered fixing a pizza pasta salad. 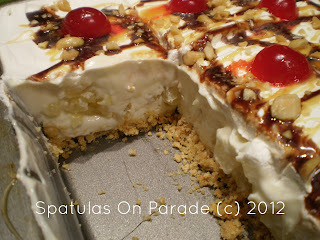 This led me on a search through my recipes and low and behold I found it. This afternoon after returning from a few errands in town, I decided to throw this together for tonight. 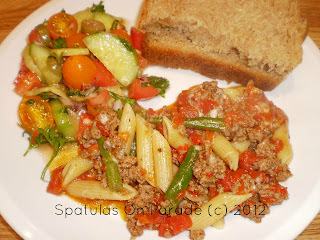 It is very hot outside and this cool dinner with lots of wonderful fillings will hit the spot. Besides, I've already baked cookies and chocolate coconut bars and the kitchen is hot enough. Give this a try and change up the ingredients if you like. 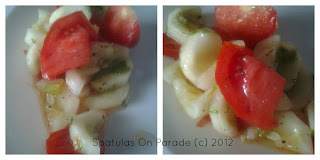 Add onions, bell peppers, fresh mozzarella balls or sun-dried tomatoes in olive oil. Whatever suits your fancy I say. This is what I did for tonight. Cook the pasta, drain and allow it to cool off. Dice your tomatoes and any other veggies you decide to toss in. Chop the salami and add all the ingredients into a large bowl. Toss well so everything is coated with the dressing. Place in the fridge or serve immediately if you prefer a room temp salad. 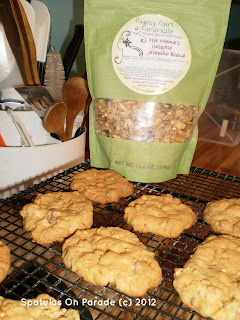 A few weeks ago I won a bag of Gypsy Girl Granola , this was the prize for the top 3 recipes on our weekly Foodie Friends Friday. I was very excited, that is until it arrived. Hot Mama's Chipotle and Jalapeno Blend...oh dear. I can't eat hot and my husband doesn't eat granola. Now what do I do with it??? My son, getting his smarts from his momma (wink wink) says "make chocolate chip cookies"
Here it is...my cookies. They are delicious, light, crispy with a little hint of pepper bite to them. My son has already given them two thumbs up. Take the first 4 ingredients and blend them well in a bowl and set aside. Next take the two sugars, butter and egg. Mix until nice and creamy. Now add the granola and chips. Remove to a rack and allow to cool, if you can resist. 3-4 dozen cookies depending on the size you make. Yep, you read that right. Chicken Cordon Bleu Egg Rolls...oh wow wow wow. I saw this idea on another blogger site, but forgot to write down where I saw it, so I apologize for not giving credit to who I borrowed this from. It is so super simple and tasty. My middle son LOVES cordon bleu and he LOVES egg rolls, so when I mentioned this to him, he was like "you're gonna make them right, right, say yes" how can you turn down a request like that? I can't. I baked them so they are not full of fat from the fryer but I will admit, I think they would be slammin' if they were deep fried. However, the baked ones were delicious. Lay out your wrapper, place a slice of cheese, ham and chicken, sprinkle with the onion powder, roll and seal with the egg wash. Once you have them all done, place them on a greased cookie sheet and bake. 350 degrees for 20 minutes , then flip them over and bake another 10 minutes. It has been a rough week and I just want to thank my friends, family and foodie followers for your friendship, kind words and encouragement that you have given me. It really means a lot. Last night there was not a 'new' recipe. My husband had been asking for the fish tacos again. I had promised to fix them over the weekend but one thing happened and that led to another, well, it just didn't happen. Then Monday night he worked late so last night we finally had them. Along with a cucumber and tomato salad. It is extremely hot here and wet. Seems everyone else is suffering from a drought and we are in drought conditions so they say, but my yard is standing in water and the grass desperately needs to be mowed. If this keeps up we'll have to buy a goat to go along with all these chickens! 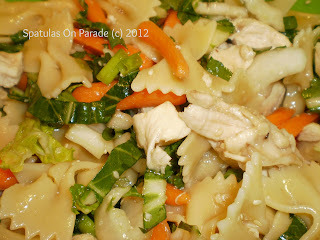 You'll have to come back by later to see my recipe and photos as I will be trying something new. Of course, that is what I'm always doing. I am going to make two things that my son loves and roll them into one. Yep, egg rolls and chicken cordon bleu. I'll let you know how it works out. OH SHOOT I just remembered, I have someone stopping by this afternoon from out of town. Dang it....guess I better go and get things straight and figure out what off of my menu I'm fixing for tonight and rearrange that. hmmm...now what to do. 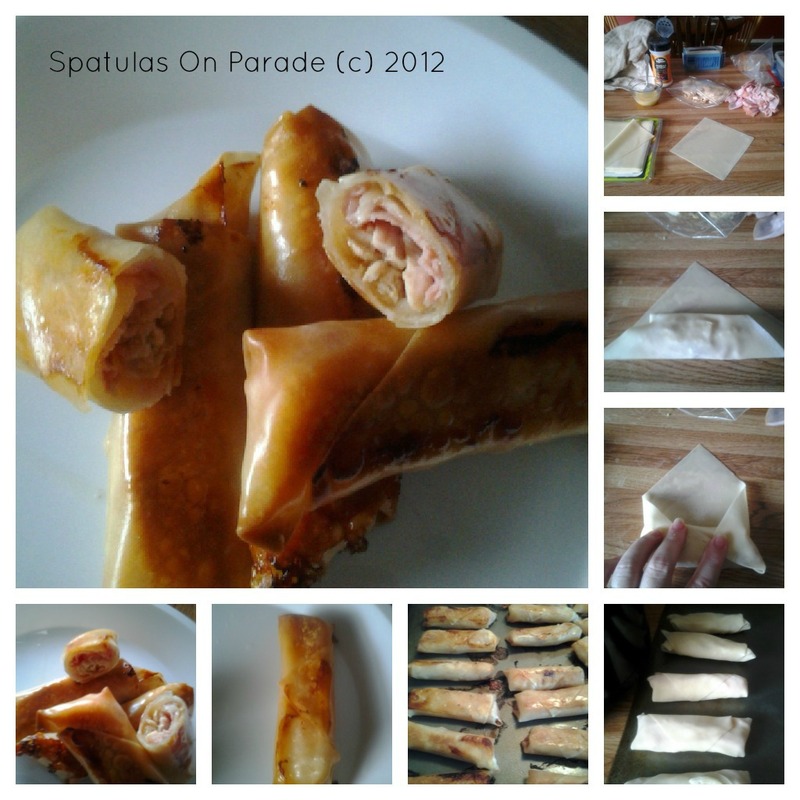 Well, the egg rolls turned out FABulous! see the next post for the recipe and pictures! 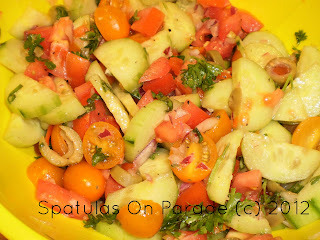 Here is the picture of the cucumbers and tomatoes as promised. So tasty!! Crock Pot Lasagna one difference I use ricotta cheese instead of cottage. My mom made this years ago and it was a big hit, I made it for friends one year for Thanksgiving and from that time on they would ask me when I was making it again. It had been years since I made this and as I was combing through my recipes and clearing out the cobb webs from my memory banks recently that is when this lovely recipe came into view. I KNEW this had to be done right away. With this hot weather I try not to bake as much and find light but filling recipes. Well, let me tell ya, if this doesn't hit the spot for you, well...I just don't know. First grease a 13 x 9 pan and set it aside. Melt your butter and pour it into a bowl along with the crushed graham cracker crumbs and 1/4 cup of the sugar. Mix this well. Press the mix into the pan and set it in the freezer for at least 10 minutes but it works better if you leave it a half hour. In a mixing bowl combine your cream cheese and remaining sugar. This you will spread over the crust after it is frozen, it makes for an easier spread. Slice your bananas and place them over the cream cheese mixture, pour your drained pineapple over this and spread. Now mix your pudding with the milk and stir in half the container of cool whip. Spread this over the pineapple. Gently so as not to disturb all the under layers. Top with the remaining cool whip. 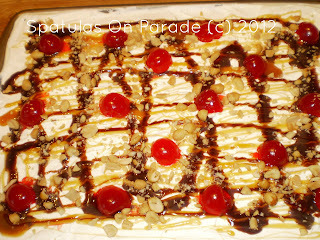 Now drizzle caramel syrup, chocolate syrup, sprinkle crushed peanuts and place the halved cherries on top. WA-LA Done and man how gorgeous is that?! As Mr. Food says "oh it's so good"
Hi to all my lovely followers, friends and family, it has been a busy and stressful last few days and I have several post to do this morning. 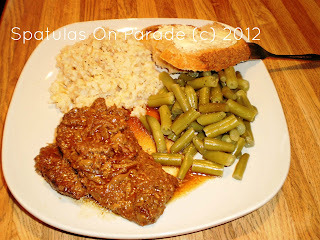 First let me say THANK YOU for viewing and voting on this weekends Foodie Friends Friday post. I made #1 all thanks to your votes! I have made the top 3 every week that I have participated, except for one. We all a lot of wonderful recipes submitted. Two of my favorites were Chelseas recipe for Boeuf Bourguignon and Anita's Shepherds Pie both of these lovely dishes got my vote. Our top 3 winners were, #1 Molasses Cookies from Spatulas On Parade , 2 Bacon Cheddar Fries and 3 Salted Caramel Triple Chocolate Cake both of these great recipes are from SAHM. Way to go!! 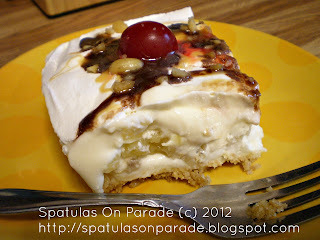 If you did not look at these recipes, please go over and give a look-see! We have some wonderful host/hostesses for our FFF party and our participants are just as wonderful. Now on to a couple of new recipes. I called it Tex Mex Night because I'm not original enough to think of anything else,but it could be called dinner in hand, supper on the go, let your imagination run wild. That's it. Simple and delicious. I am not a black eyed pea fan, unless it is music, but I did enjoy this. My husband said "NOW that's the way to eat black eyed peas" Two thumbs up from the man, must be good. Cook the meal and onion until done. Drain if needed. Add the corn, spices, lime juice, and beans. Mix well. In a bowl combine the baking mix, milk, eggs and cheese. Allow the meat/veg mixture to cool slightly then add to the baking mix. Stir well. Fill a greased muffin tin and bake for 35 minutes or until they are done. Serve with the black eyed peas, salsa, guacamole, sour cream or whatever you like. 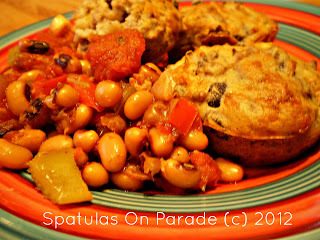 If you are vegan or vegetarian these can be made without the meat and still be filling and delicious. Do you have a favorite cookie? I don't, because I have never met a cookie I didn't like. I have a fondness for some, others I'm ok with and some I just absolutely am in love with. Shameless I know. 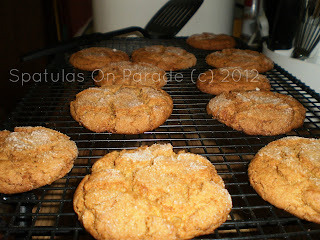 Many years ago my husband asked me about molasses cookies. I said what about'em. I had never had one, imagine! So after much research, trial and error. We came up with a killer recipe or so we thought. Only to find it in other places as well later down the road. Oh well, we love it and I have several friends who beg me, yes beg, for me to bake them some. So here ya go folks. My molasses recipe. In a large bowl, combine these ingredients and blend well. Slowly stir in these ingredients. Lightly grease a cookie sheet or two if you have them. Shape the dough into 1 inch balls and roll in sugar. 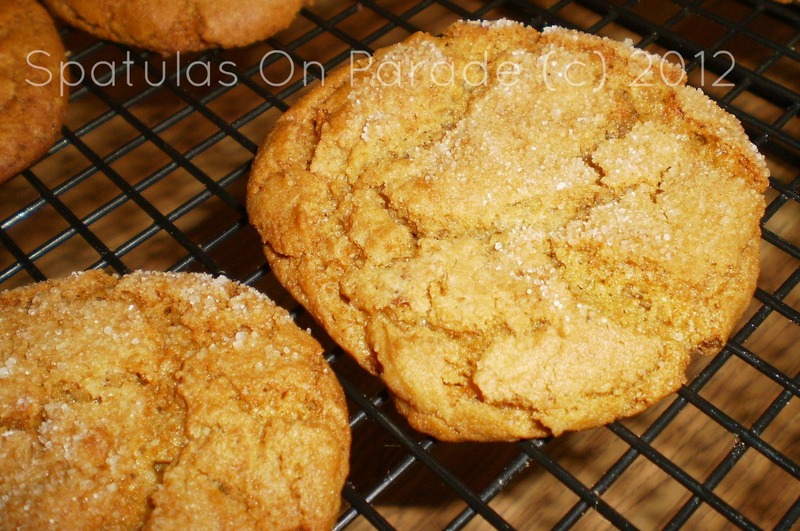 Place them on the cookie sheet, 2 inches apart and bake for 12 minutes. The edges will be set and the center soft. If you like softer cookies, go 10 minutes, any longer than 12 and you will be eating bricks when they have completely cooled off. We eat ours hot. Cool for 1-2 minutes before removing from the sheet. This makes roughly 3 dozen. I normally mix up a second batch of dough while the first batch is baking. You can double the recipe and make on large dough, but I think it taste better when I do it separately. Well, Tuesday was just a normal day. I baked a loaf of honey wheat bread, a batch of molasses cookies and tossed dinner in the crock pot. Little did I know that later that same night my world would be turned upside down. I can not go into details, but if you are of the belief, as I am. That no matter how good or bad our days are, God is still in control. Life our family and the family of long time dear friend, up in prayer. God is good and only God is good, all the time. No matter the situation, no matter how tragic. My life will never be the same but my God never changes. Everything went into the crock pot on high for 4 hours, then low for 1 while I waited for everyone to get home. Ah yes, breakfast for dinner. Who does this? We do! 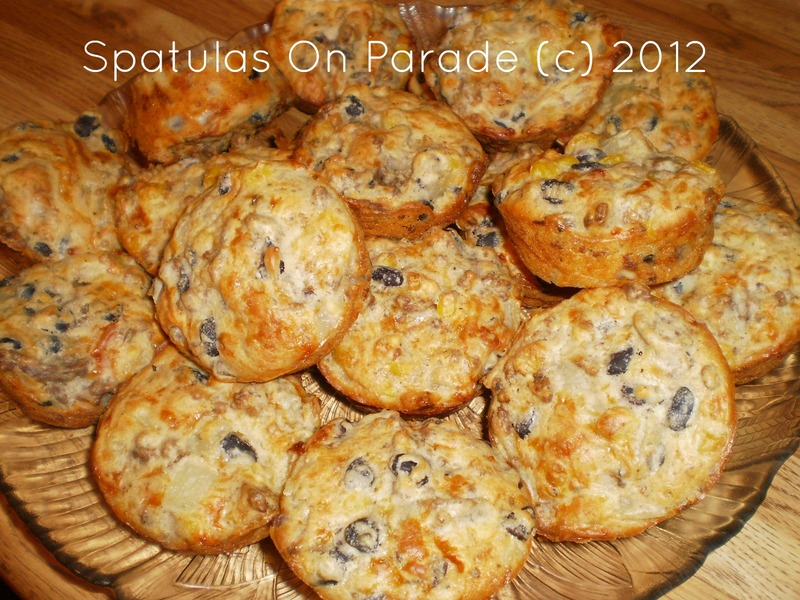 Sometimes it is a breakfast casserole or pancakes, muffins and fruit, or a wonderful garden omelet. I might go all out and thrill my husband by cooking bacon, eggs, grits, toast and hash-browns. You never know because I have been known to do it all. Last night was a wonderful breakfast casserole, made with fresh eggs from my hens and lots of wonderful veggies. I must say, there was a BIG difference in the taste using fresh eggs. If you have never eaten a farm fresh no hormone or chemical added egg, you haven't had a good egg! Now to go with that was home made biscuits and sausage gravy. Yes I know it was not a healthy meal per say but it was "oh so good" as Mr. Food used to say. Tonight we are having crock pot cube steak with gravy, rice and green beans. If I can get off the computer we might have a lemon zucchini loaf or molasses cookies as dessert. You know how it is,right? You get on line to check your email, then your Facebook and you see a recipe, you follow the link and the next thing you know you are lost in the wonderful world of Pinterest and it has been several hours! YIKES...oh no, not you you say? Poo Poo I say. I bet you do, well if not, I'm not above admitting I'm a Pinterest addict. It inspires me, gives me new avenues to explore and brings a feast before my eyes of color, food, places and things...ok maybe that's a little much for you, but really, it's true. So,off I go now to bake, do dishes (again) and maybe read some, who knows. Oh wow, I'm behind! Friday night was an easy crock pot Mexican bake. Saturday was my dad's side of the family, family reunion and when we got home I was exhausted. So I whipped up some Pepperoni Bacon Pizza puffs and on Sunday I fixed a crock pot full of beans and ham, baked some biscuits and called it done. The Pepperoni (bacon) Pizza puffs are here. The ham and beans was for my husband. He is a ham lover. I purchased some smoked ham chunks from our local butcher, tossed those in my crock pot with some onions, green peppers, lima beans, butter beans, speckled beans, kidney beans, white kidney beans, carrots, beef broth and shut the lid. 4 hours on high and we were eating! I also made some biscuits to go with it. The Mexican layer bake I normally do in the oven but did not want to heat up the kitchen Friday night, so I decided to fix it in the crock pot. It turned out fine. You should use your crock more often, trust me, it is a lot easier, less mess, less electricity and heat. I want to say THANK YOU to all my friends and foodie followers who voted yesterday. My Orange Pecan Brownies came in second place. So once again I made the TOP 3!!! You really made my day. It is humbling, thrilling and makes me smile. I do hope that you are not just voting but also trying these recipes. When you do, please come back and let me know! Cook the beef along with the water, seasoning, peppers, onions and corn. 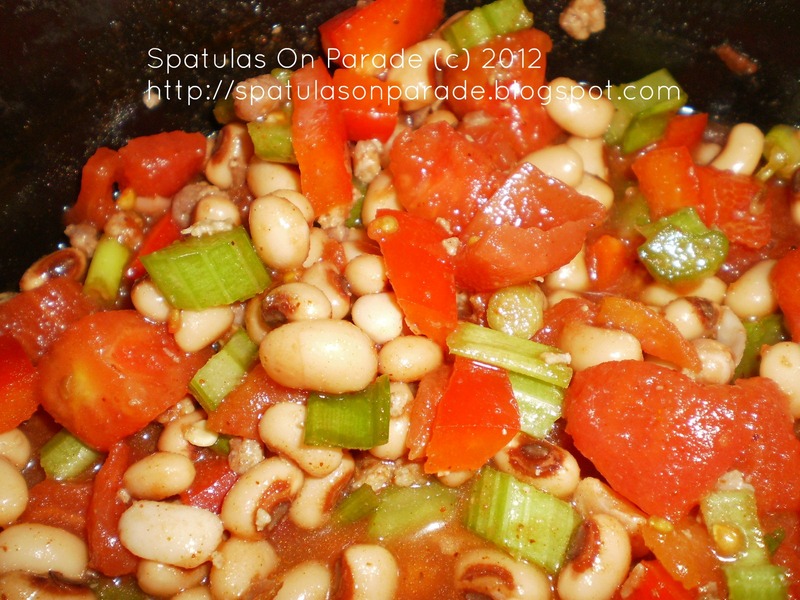 Add the tomatoes and beans. Mix thoroughly. Place some of the mixture in the bottom of the crock pot. Then place a layer of tortilla on top. I cut mine so I could get better coverage as my tortillas were small. 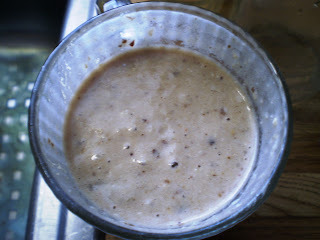 Next I placed 1/2 of the mixture on top and repeated the process. Once I had all the layers complete I topped it with shredded Mexican blend cheese and placed the lid on top. I cooked it on low for 3 hours. Can you believe today is Friday already? This week just flew by, but then again this whole year has been on fast forward it seems. Last night was odd, there was no one home for supper except for me. We had horrible storms and lightening hit the building where my husband works. No one was hurt but it reeked havoc on the computers, phones, security, well anything electrical. Which meant he could not leave until that was all up and running again. I was in the mood for a salad but had taken out some chicken tenders, so I decided to do something I had not done in awhile but is a favorite of mine. I sauteed those tenders and put them on a lovely salad. ah, it hit the spot. Hope you all have a lovely Friday and fabulous weekend. 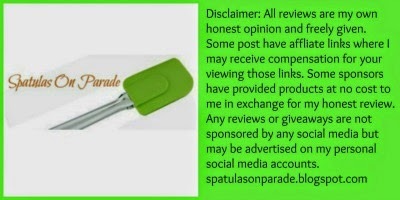 Be sure to stop by my Foodie Friends Friday page to see what all the excitement is all about! Coat the chicken with saffron and saute the chicken in a little oil, then dice it up and place on top of salad. 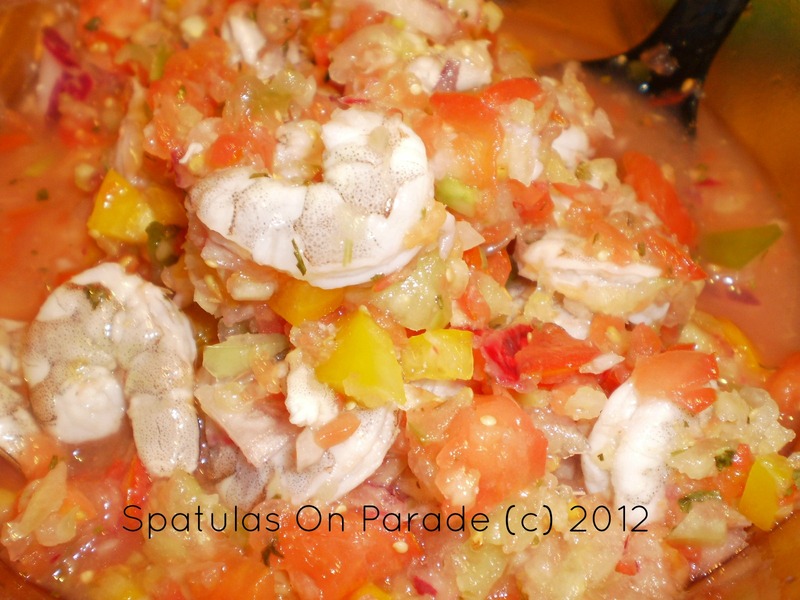 Chop all other ingredients and place in a large bowl, toss and serve. Do you ever look at your menu plan and think I don't want any of it or I'm so hungry I want it all? I did yesterday but I was also thinking about my family and how they have been such good sports. Never knowing what I will fix and if they will ever get their favorites again. So last night was a decision to follow the night before, an old favorite. I figure with 2 in a row, I should be able to get away with a new and different item each day for at least another month. Last night was Shepherd's Pie. Sorry no pictures, as my son was gone all day and well after dinner, with my camera. I tried taking pictures with my phone but they did not look appetizing at all. Who wants to see a picture of food that looks nasty? Not me. If you are not familiar with shepherd's pie I do hope you are a visionary and can see it in your minds eye. If you are familiar you may be thinking, after reading my recipe, that that is NOT how it goes at all. Remember, I don't follow instructions and I march to the beat of my own drum. So my recipe is a little unconventional. Now on to dessert, I had been craving chocolate and sweet. Really I wanted lemon yesterday but I had no car and was short one item for every recipe I wanted to fix. So...off to my old reliable chocolate cake recipe. I decided to make it in the form of cupcakes instead and I wanted to try fixing my own frosting again. This is a task that I have not mastered. Some days I fix frosting and it is lovely other times not so much. Like yesterday, it is ugly frosting but oh so good. 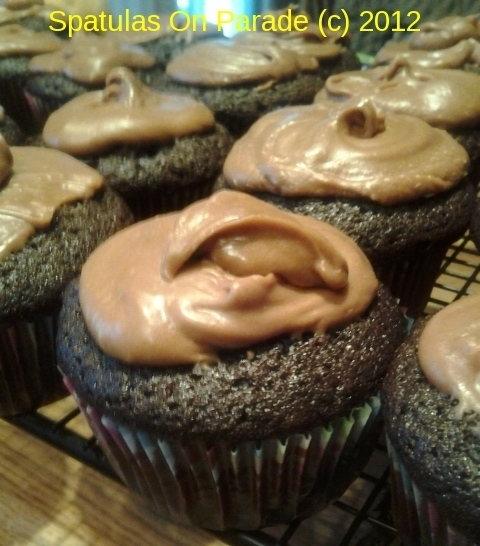 My cupcakes look like someone pooped on them. Oh well, grandma always used to say "if a cake is ugly that just means it taste good" well she is right on this one. 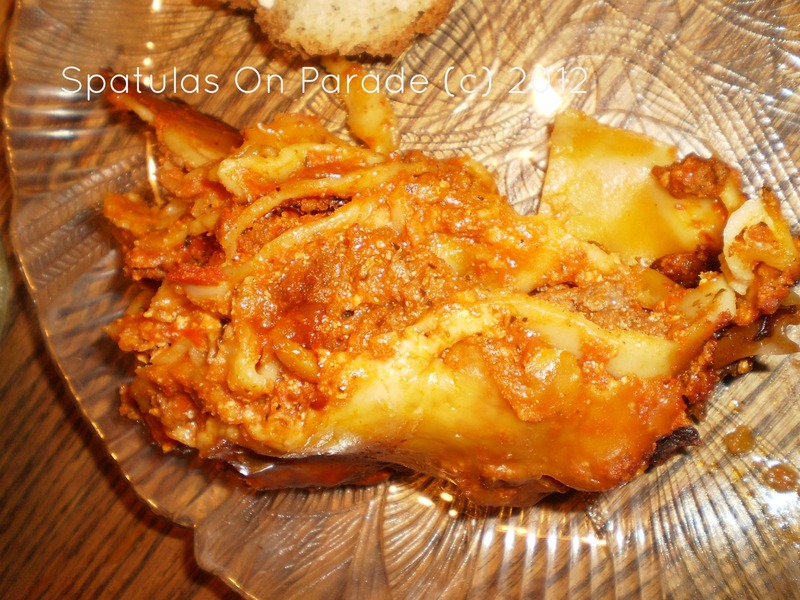 Hope you will give these recipes and others a try and when you do, please be sure to come back and let me know if you changed it, how you liked it and if you'll do it again. Cook the meat with seasoning in 1/3 cup water, break down until fine crumbles. Cook until done. In a crock pot add all other ingredients. stir well and cook on low for 2-4 hours. 30 minutes before time to eat, mix up instant mashed potatoes, 6 servings and place on top of the mixture in the crock pot. Allow this to cook for 30 minutes. 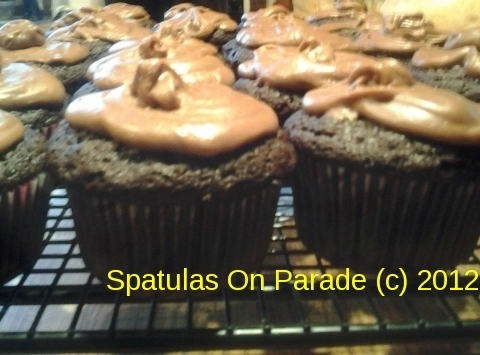 Preheat the oven to 350 degrees and line your cupcake pan with liners or spray a 13 x 9 baking pan if you prefer. Sift powdered cake ingredients into a bowl and set aside. In a large bowl add mayo, vanilla and water. Mix well. Once the liquid is smooth, slowly add the dry mixture and incorporate well but do not over mix. Pour batter into the pan or dip into cup cake liners. Bake for 25 minutes for cup cakes, 30-35 for caked. Allow to cool and frost. Frosting: in a bowl beat butter, melted chocolate and vanilla. Slowly add the powdered sugar and add milk one tablespoon at at time to the get the consistency you desire. Once cupcakes/cake is cool, frost and enjoy! Salmon Patties - whose a fan?